While the Costa del Sol is known for its endless beaches, inland white (and blue) villages hold some fascinating places to visit. The Costa del Sol in southern Spain is a popular holiday destination, with its endless clean beaches, water parks, aquariums and more. However, a short drive inland will take you to the famous Andalucian Pueblos Blancos (White Villages) where there are narrow, winding and cobble-stoned streets, lined with beautiful white houses. These homes have flowering bougainvillea and geraniums blossoming on their balconies and often you can hear the sound of songbirds as you stroll. These white villages also have sometimes strange, and often unnoticed, attractions that are worth spending some time there. First, we visit the hilltop town of Ronda, with its fascinating torture and witchcraft museum. Then we head to a village literally built into the surrounding cliffs. There is also a town painted Smurf blue, an unusual rocky landscape, and a fascinating crypt. Museo Lara is a museum set in a historic building in Ronda. It has a wondrous display of historic items. The main floors display collections of old handguns, watches, typewriters, microscopes and vintage sewing machines. The lower floor features paraphernalia relating to bullfighting and movie projectors. 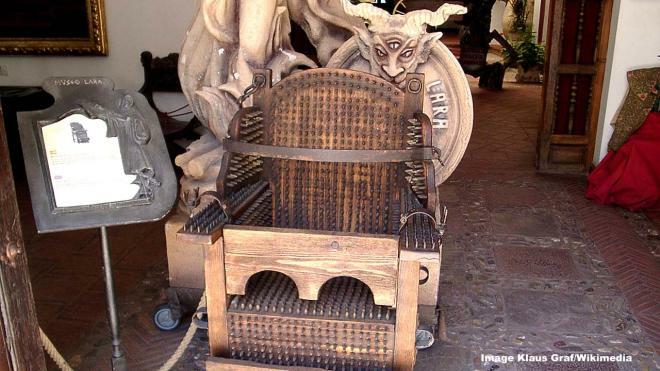 However, the cellar is far more sinister with its “Living Inquisition” exhibits, including items used in sorcery, witchcraft and the brutal Spanish Inquisition like the pictured torture chair. 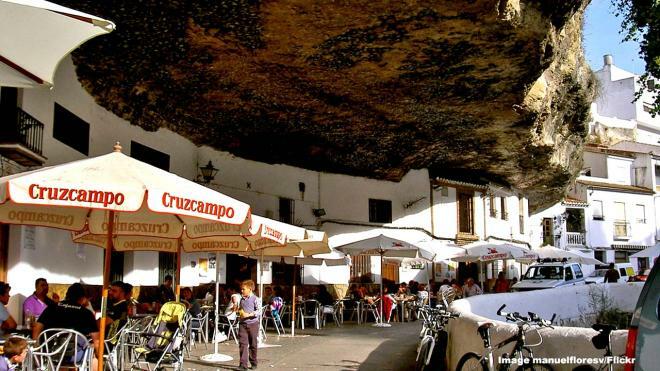 Setenil de las Bodegas is a white village with a difference. As Atlas Obscura writes, the buildings are built into the rocky cliffs, leaving overhangs of rock over the streets. The Moors built the village in the 12th century, using the surrounding cliffs as a natural protection. The buildings are pretty much the same today, as you walk the winding narrow streets or enjoy a coffee or beer, with the cliffs hanging over you.